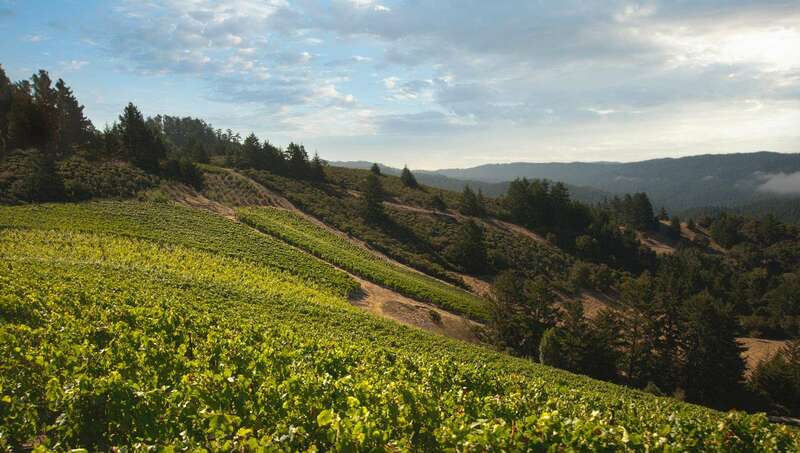 One of the wine world’s best kept secrets, the Santa Cruz Mountains have long produced some of the New World’s very finest wines. For decades, inspirational wines like Ridge Monte Bello and Mount Eden Chardonnay have thrilled serious wine enthusiasts. In addition, there have been many legendary Pinot Noirs from producers like Mount Eden, David Bruce and Santa Cruz Mountain Vineyards. At their best, Santa Cruz Mountain wines offer all the key ingredients for truly fine wine – breathtaking balance, terrific concentration, uncommon minerality, thrilling complexity and Old World age worthiness. With approximately 600 acres planted to Pinot Noir in the entire appellation, Santa Cruz Mountain Pinots are also quite rare. Santa Cruz Mountain Pinot Noir derives its quality from a very unique confluence of climate and geology. The appellation is bordered by two bodies of water – the Pacific Ocean on the west and the San Francisco Bay on the east. This situation creates a cool climate that moderates California’s late season heat spikes, producing intense wines with beautiful balance. Our vineyards have been carefully selected to highlight the unique conditions found in these geologically diverse mountains. Each of our six sites is located on a unique and completely different geology. It is fascinating to taste how these conditions produce such distinctive and different Pinot Noirs. Located over 100 miles north of San Francisco, the wine producing reputation of this beautiful, remote valley has been steadily climbing for decades. The 16 mile long, transverse valley extends from the southeast to the northwest and becomes increasingly cool as it nears the Pacific Ocean. The geology in the valley is quite diverse but includes a band of rocky southwest facing hillsides that produce intense, mineral driven wines of great elegance. We selected the site for our Bearwallow vineyard in the coolest northwest corner or “Deep End” of the valley where we have planted 31 acres on the rocky slopes.